Home Tags Posts tagged with "typhoon hagupit"
Hagupit has been downgraded from a typhoon to a tropical storm after crossing the Philippines heading to capital Manila. At least 21 people were killed by the storm, the Red Cross said, with the eastern island of Samar worst hit, but it caused far less damage than feared. Thousands of people are heading home after about a million people were evacuated from vulnerable areas. The city of Tacloban, which bore the brunt of Super Typhoon Haiyan in 2013, has emerged relatively unscathed. In Manila, residents are preparing for heavy rain and strong winds. Typhoon Hagupit is still travelling westwards across the Philippines, and has weakened into a tropical storm, according to the Philippine meteorological authorities. A government alert on Monday morning stated that residents of the capital and surrounding regions should expect winds of up to 62mph in the next 24 hours, and to prepare for possible flash floods, landslides, and storm surges of up to 6 ft.
Thousands who live along the coast and riverbanks were evacuated on December 8, reports said. A total of 11.8 million people live in the national capital region. Financial markets in the Philippines would be closed on Monday, December 8, statements from the Philippine Stock Exchange and the Bankers Association of the Philippines said. Schools were closed, commercial flights were cancelled and civil servants told to stay at home. Correspondents say Hagupit has been nowhere near as powerful as Typhoon Haiyan – known as Yolanda in the Philippines – which tore through the central Philippines in November 2013, leaving more than 7,000 dead or missing. In Tacloban, Hagupit blew away roofs and flooded streets, but the area has escaped the wider devastation of last year. Known locally as Typhoon Ruby, Hagupit has nonetheless caused major damage in several towns on the east coast of the Philippines. The Philippine Red Cross said at least 21 people had died over the weekend, with 18 of those on the eastern island of Samar, where Hagupit made landfall on December 6 with winds up to 130 mph. 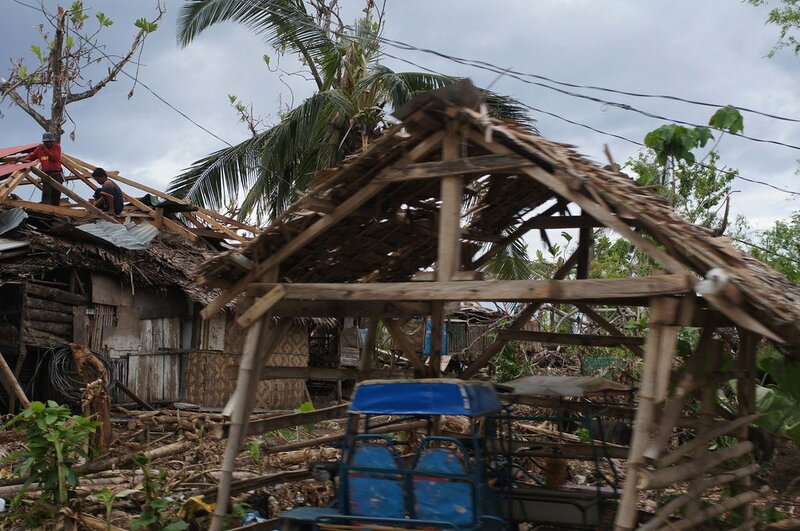 The mayor of Dolores, a town on Samar, said that 80% of homes there had been destroyed. One resident reportedly died after a tree fell on him. Two more people – a one-year-old girl and a 65-year-old man – died from hypothermia in the central province of Iloilo, the National Disaster Risk Reduction and Management Council (NDRRMC) said. A total of 183 flights had been cancelled and five airports closed, the agency said, and there were power outages in 16 provinces. Typhoon Hagupit has hit the eastern Philippines, toppling trees and power lines and threatening coastal areas with a powerful sea-surge. More than half a million people have fled coastal villages in the area, which was still recovering from Typhoon Haiyan last year. In Tacloban, where thousands were killed by Haiyan, roofs have been blown away and streets are flooded. However, thyphoon Hagupit does not appear to have been as severe as many had feared. So far there have been no reports of casualties. Typhoon Hagupit, known locally as Ruby, was packing maximum sustained winds of 109mph and gusts of 130 mph when it made landfall in Dolores in Eastern Samar province on Saturday evening local time. Dolores police spokesman Alex Robin told AP news agency late on Saturday that many trees had already come down. Maulid Warfa, the head of UNICEF’s field office in Tacloban, said their five-storey concrete building was shaking under the force of the storm. Speaking early on Sunday he said: “We’re in this dark building and it’s raining heavily and there’s no electricity and we are using candles. 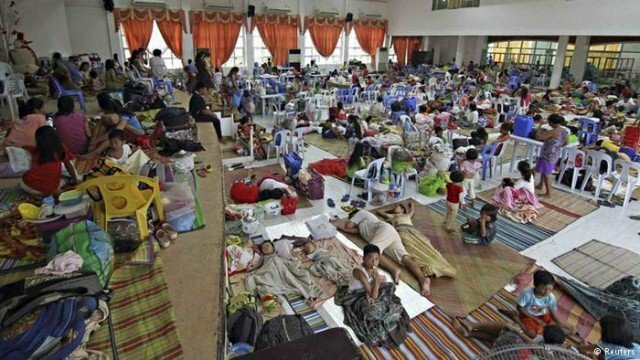 About 19,000 people from coastal villages are in 26 evacuation centers, Tacloban’s disaster office spokesman Ilderando Bernadas told Reuters. 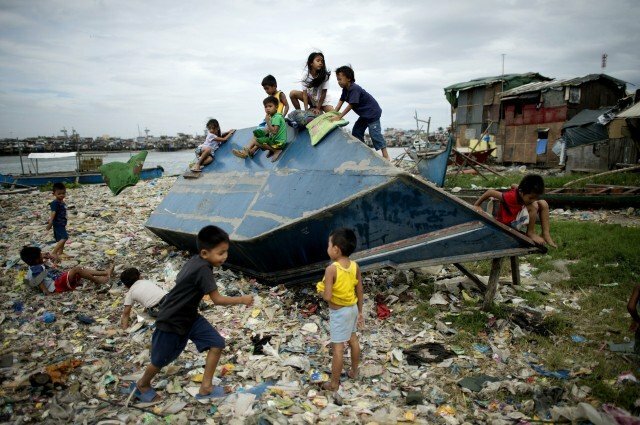 Typhoon Hagupit’s huge diameter of 370 miles meant that about 50 million people, or half the nation’s population, were living in vulnerable areas, officials have said. More than 500,000 people have evacuated their homes as typhoon Hagupit approaches the Philippines. Typhoon Hagupit, which weakened slightly on Friday night, is due to make landfall on Saturday evening. It is on course for the Eastern and Northern Samar provinces and the city of Tacloban, where thousands were killed by Typhoon Haiyan a year ago. It has weakened slightly but gusts are still peaking at 120mph. Thousands of passengers were left stranded after Philippine Airlines and Cebu Pacific cancelled more than 150 flights to the central and southern Philippines on December 5 and December 6, and sea travel services were suspended. President Benigno Aquino, who met disaster agency chiefs on Friday afternoon, has ordered food supplies to be sent to affected areas as well as troops and police to be deployed to prevent looting in the aftermath. Local media reported Benigno Aquino as saying there was “no indication” for now that Hagupit, would be as strong as Haiyan. Haiyan – known as Yolanda in the Philippines – was the most powerful typhoon ever recorded over land. 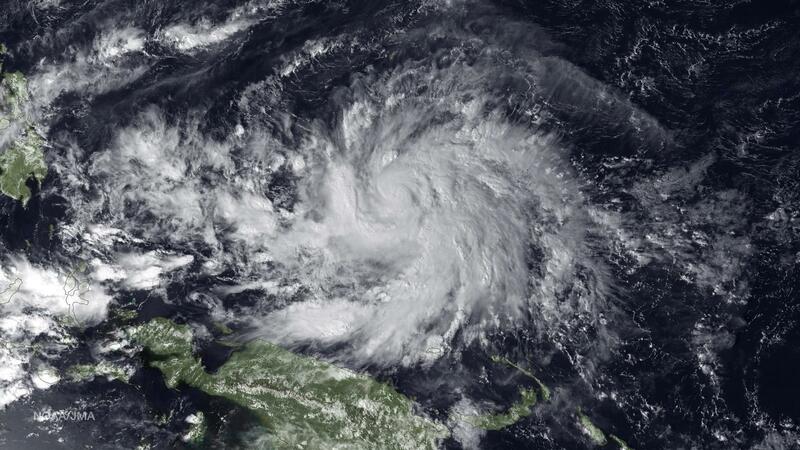 It tore through the central Philippines in November 2013, leaving more than 7,000 dead or missing. Typhoon Hagupit’s huge diameter of 370 miles meant that about 50 million people, or half the nation’s population, were living in vulnerable areas, Social Welfare Secretary Corazon Soliman told AFP news agency. The latest update from Philippine weather authorities said that Hagupit, which means “smash” in Filipino, had weakened slightly, though it still had powerful gusts. On Saturday it was churning towards eastern coasts with its eye 145 miles north-east of Borongan, in Eastern Samar province. Residents of Eastern Samar reported rain was falling and power was fluctuating. It could bring storm surges up to one storey high, as well as heavy rain and the risk of landslides, officials have warned. Schools and government offices are closed in some areas and there were long queues at shops and petrol stations as people stocked up on supplies. Tens of thousands of people in the Philippines have sought shelter as powerful Typhoon Hagupit heads towards the country. Typhoon Hagupit, or Ruby in the Philippines, has gusts of up to 143mph and is due to hit land on Saturday evening. Local residents, many of them still living in temporary shelters, are moving away from coastal areas. President Benigno Aquino, who met disaster agency chiefs on December 5, has ordered food supplies to be sent to affected areas, as well as military troops and police officers to be deployed to prevent looting in the aftermath. Local media reported Benigno Aquino as saying there was “no indication” for now that Hagupit would be as strong as Haiyan. Typhoon Haiyan – known as Yolanda in the Philippines – was the most powerful typhoon ever recorded over land. It tore though the central Philippines in November 2013, leaving more than 7,000 dead or missing. The latest update from Philippine weather authorities said that Hagupit, which means “smash” in Filipino, was weakening slightly, though it still has powerful gusts. In Tacloban, many people have taken shelter in the sports stadium. He said that number was expected to double was the authorities began forcing people to evacuate. The Philippine weather authorities said that as of 16:00 local time on December 5 Hagupit was 230 miles east of Eastern Samar and moving at 8 mph, a relatively slow speed. Typhoon Hagupit has weakened slightly, but still remains powerful, with sustained winds of 120 mph and gusts of up to 145 mph. Up to 35 provinces and municipalities are likely to be affected. The US Navy’s Joint Typhoon Warning Center had classified Hagupit as a super typhoon but downgraded it on Friday morning. 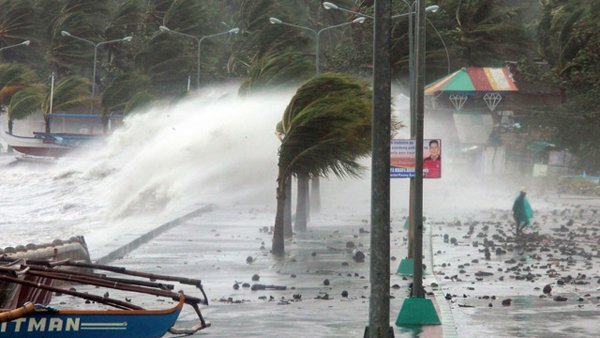 It remains the strongest storm to hit the Philippines this year. Meteorologists had said there was a chance Hagupit could veer north towards Japan and miss the Philippines altogether, but this scenario is increasingly seen as unlikely. The Philippines gives its own names to typhoons once they move into Philippine waters, rather than using the international storm-naming system. The Philippines are braced for the arrival of Typhoon Hagupit, expected to hit land on December 6. Hagupit, which is building strength over the Pacific, is slowly bearing down on the region devastated by Typhoon Haiyan a year ago. The typhoon has gusts of up to 105mph and is expected to be a category 4 storm by December 6. Thousands of people, many still living in temporary shelters, have been told to go to evacuation centers. Haiyan, known in the Philippines as Yolanda, was the most powerful typhoon ever recorded over land. It tore though the central Philippines in November 2013, leaving more than 7,000 dead or missing. Typhoon Hagupit is not expected to be a powerful as Haiyan, but could bring storm surges up to one storey high. The vice-mayor of Tacloban, the city which was worst hit by Haiyan, said the authorities were enforcing evacuation orders. “We have no more excuse, we have gone through Yolanda, and to lose that many lives, it’s beyond our conscience already,” Jerry Yaokasin told reporters on December 3. Meteorologists say there is a chance Hagupit could veer north towards Japan and miss the Philippines altogether, but officials said they were preparing for a worst case scenario.